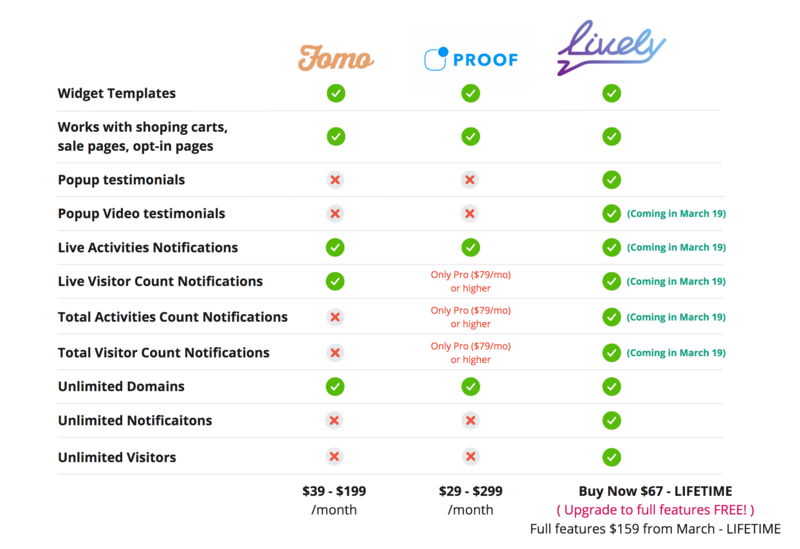 Lively is a cloud base software that will allow you to be able to create tiny testimonial popups and show them in any of your funnels. These popups will instantly build credit for the product you offer. When people visit your website, they will see these tiny popups showing what other customer say about your product, or describe how great your product is. They will feel more confident to use your product as well as other customer do. 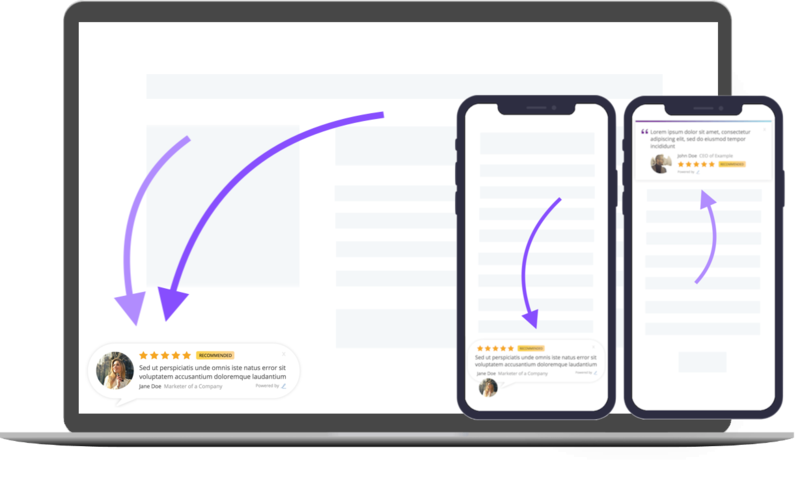 The benefit of showing testimonials as popups is that the tiny popup can significantly increase visitors attention to read your product's reviews, wherever they are on your page. They will instantly feel confident, trust, and are more likely to make a purchase when they reach your sale button. Most of the time, these popups can be a final push to purchase for your visitors. Since people always looks for the actions of others to guide their own actions when they are uncertain, or making decision. In this case, your testimonial popups will be the easiest thing for them to look for. They don't even need to scroll back, or find the review section to gain confidence. 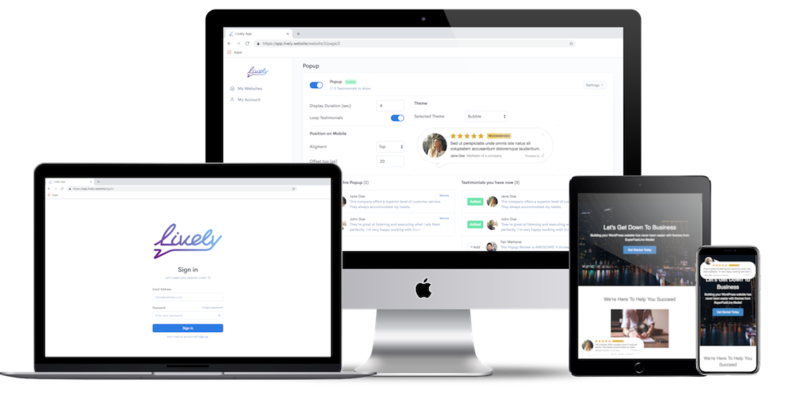 Lively takes the benefit of popup mechanism and the timeless psychological marketing tactic called "Social Proof" to build a ready to use cloud base software, which can be integrated into any websites in the world, and can double, triple, or sometimes even quadruple your conversion! 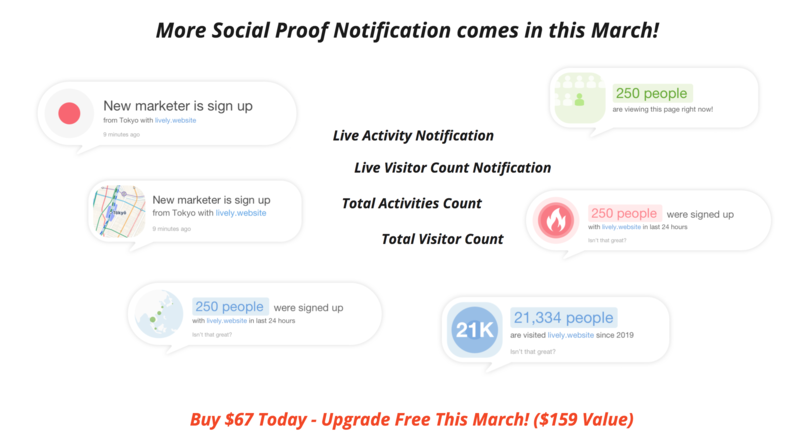 In March 2019 Lively will comes with full features of "Social Proof" with the price of $159 - LIFETIME Access. But, If you buy it now - you will pay only $67 LIFETIME and get upgrade to full features for FREE! If for any reason you are not satisfied with Lively, just email our support at support@lively.website with a copy of your receipt and your request. What type of websites does Lively support? As long as you can add a snippet of code onto each page you want Lively Testimonials to display &ndash; it will work. This includes WordPress, ClickFunnels, LeadPages, InstaPage, WIX, PayKickstart, checkout pages, and lots more. How long is this Lifetime Package available? This Lifetime Package is only available for a limited period of time. In the future we will offer only Subscription Packages. YES! We have a 15-day money-back guarantee for Lively. 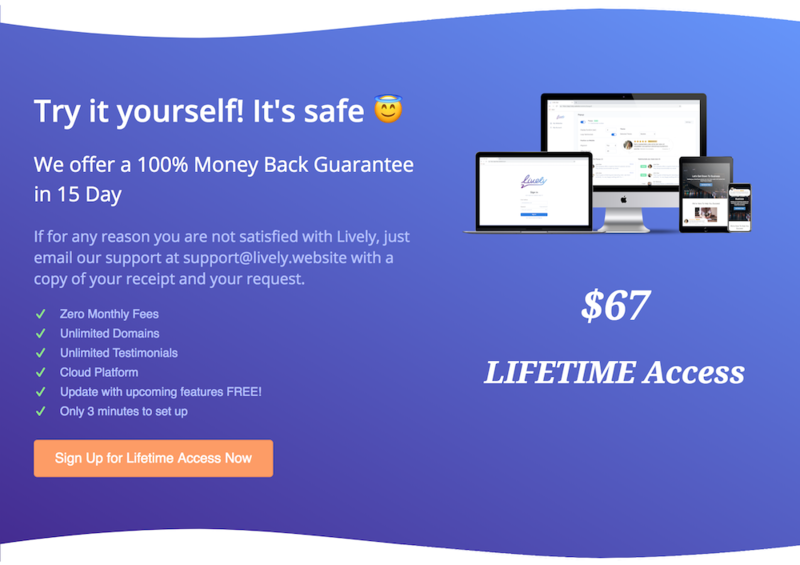 If for any reason you are not satisfied with Lively, just email our support at support@lively.website with a copy of your receipt and your request.